Corghi presents Artiglio 500, the new automatic tire changer with 2nd generation “Leva la leva (Without lever) technology for vehicle, SUV and commercial vehicles wheels up to 32 . 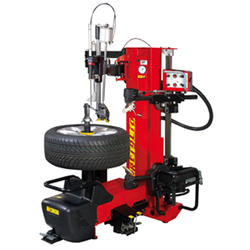 A natural evolution of Artiglio 50, this new tire changer maintains its best qualities and also presents many technical innovations: dynamic bead breaking device with a dual bead breaker disc, newly designed head group, more performing wheel support plate clamping, reinforced structure, great attention to ergonomics and control availability. All of this means a faster operating speed without risks to the operator and the rims, even during the most critical phases, great simplicity of use and universality, for equipment whose features can be used 100%. The company could modify the characteristics of the products anytime. The manufacturer reserves the right to modify the characteristics of its products at any time.